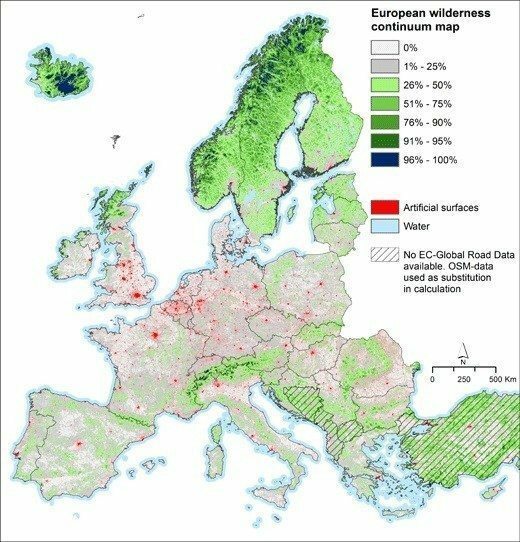 The University of Leeds has unveiled the first comprehensive survey of Europe’s remaining wilderness areas. Today, just 1-2% of the EU’s land area is formally protected. Conservationists hope to increase this to 5% within the next 10-15 years. The resulting map and Wilderness Register for Europe, which sets out the quality of each area as well as existing levels of protection, will shape European Union policy on these ecologically important sites for years to come. Scandinavian countries and Iceland come out top when it comes to having the biggest proportions of Europe’s wildest areas – based on the project’s criteria – which include naturalness of vegetation, remoteness from settlement and other human infrastructure, and remoteness from roads (mechanised access). Mountain areas further south – the Pyrenees, Austrian, Swill and French Alps and the Carpathians – are also well represented. England and Wales have no qualifying wildernesses according to the register, while north-west Scotland possesses some key areas. Dr Carver has worked with Alterra, part of Wageningen University in the Netherlands and lead partner in the project, as well as The European Wilderness Society, the leading European wilderness protection organisation. The project is funded by the European Commission and European Environment Agency.The register is a work in progress, with a final report to the EC and EEA due to be published next spring. All European Union states have cooperated.